At 1:05 p.m. Thursday an announcement went out over the loudspeaker at Royal Valley High School asking students to place their bags, purses and other personal belongings out in the hallways and to remain in their classrooms until further notice. After the bags and students were in place, two drug-sniffing dogs and their handlers from the Jackson County Sheriff’s Office entered the school in Hoyt to perform an unannounced search of the bags, lockers and parking lot. After a 55-minute search, that included a 10-minute break for the dogs, no illegal drugs were detected. The search was one of two or three conducted at the school on a yearly basis, Holloman said. “The students are told each fall that we’ll do the searches. They just don’t know when,” he said. Members of the Royal Valley Board of Education recently voted down (five votes to two) drafting a policy to randomly test students for drugs. Board members have spent the last two months meeting with parents and district patrons to discuss drug use in the district and how to combat the issue. Holloman noted that the school already implements a variety of methods to help curb drug and alcohol use in the school, including the drug dog searches. If a dog detects something in a bag, locker or car, the student or teacher is approached before the property is searched, it was reported. “We ask them if there is something we need to be aware of before we open their items,” Holloman said. While there are times, like Thursday, when nothing is detected, there are instances, in the past, when one or more “hits” have been made by the dogs. Sometimes a “hit” turns out to be unmerited, like the instance when ice melt in the back of a teacher’s vehicle triggered a dog, Holloman said. Thursday’s search was conducted by Benny and his handler, Deputy Travis DeBarge, and Bak and his handler, Deputy Travis Spiker. Both Benny and Bak are German Shepherds, and they are between two to three years old. Their services are provided for free by the sheriff’s office. The dogs and their handlers spend five weeks training with the Kansas Highway Patrol and they must be certified once a year, DeBarge said. Holloman said the dogs are an effective tool for the district. “The kids are used to the searches, and it’s just one of the things we do to help keep the kids accountable,” he said. During the 2014-2015 school year, the high school reported two student suspensions involving illegal drug use and five student suspensions involving alcohol use, according to a report Holloman submits to the state each year. The report reflects the number of individuals suspended and not the number of incidents, Holloman said. In the 2013-2014 school year, there were five student suspensions for drug use on school grounds and no suspensions involving alcohol. 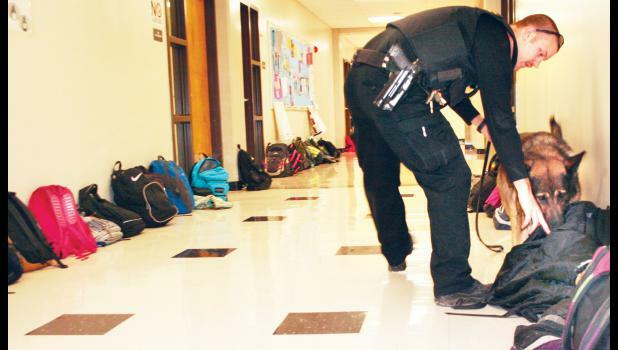 It was reported that drug dog searches have been conducted in the past at Holton High School and that searches are not regularly conducted at Jackson Heights High School.